Amjad Fareed Sabri was a renowned Pakistani Qawwal, Naat Khawan, Singer and a great Proponent of the SUFI Muslim Tradition, born and raised in Karachi. His father who was also quite a big name in Qawwali and folk singing along with his uncle. His father was Ghulam Fareed Sabri and Uncle was Maqbool Ahmed Sabri. They were one of the most promising and inspirational Qawali singers of their time in the whole Indo-Pak subcontinent. This family of Qawali singers were known as the "Sabri Brothers". As a son of the great Qawwal celebrity and a nephew of Maqbool Ahmed Sabri, Amjad Fareed Sabri started his career often reciting poems written by his father and uncle. Sabri Brothers have given a number of Soulful Qawwali performances globally and their statue in the sub continent is colossal. Amjad Fareed Sabri along with Sabri brothers troupe has toured Europe, Africa, Asia, America and the Middle East. They were the first exponents of the Qawwali to the west, when they performed in the renowned Carnegie hall of New York in 1975. Amjad Sabri was born in 1976 in Karachi. He started learning the art of Qawwali from a very young age of only nine years and at the age of 12 he performed with his father on stage. He was flawless in "Raag Bhairon" which was trained by his father. Every day he has to get up so early to perform tahajud prayer and then practiced the Qawwali to learn the mastery of this art. He also travelled to almost the whole world along with Sabri Brothers troupe and was known as the "Rock Star" of the Qawwali. He used to recite chorus and clap in his family band Sabri Brothers. After the death of his father and uncle he worked as a vocalist and also played drums in the Sabri Band. But as the pioneer brothers of the band were gone. So the Sabri brothers troupe came to end. In 1996 he then started his own Band along with his three brothers and friends. Amjad Sabri sung the same poetry which his father and uncle has written and then started his own compositions including "Ali Ke sath hai Zahra Ki Shadi" and " Na Poochiye ke Kiya Hussain Hai". 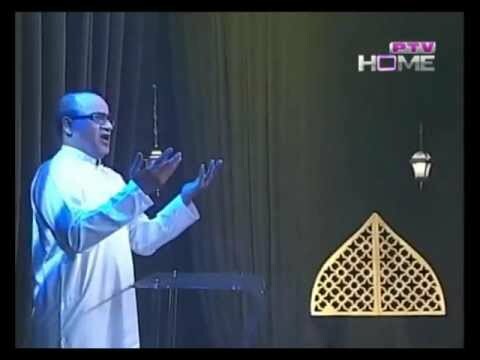 His most famous naat "Karam Mangta hin Ataa Mangta hun" and "Ae Sabz Gumbhad Wale Manzoor Dua Karna" has rocked his ratings. Similarly "Phir dekha de Haram" and "Tuloo e Seher hai Sham e Qalandar" has gaga of the followers. He also sung in the coke Studio along with Rahat Fateh Ali Khan and performed an outstanding Qawali number "Aaj Rung Hai". This was his first and last performance in the coke Studio. He was shot dead in Karachi in June 22, 2016. May Allah Swt showers his blessing upon him. Rest in Peace Ameen. His last naat was " Ae Sabz Gumbhad Wale Manzoor Dua Karna".